Is there ANY way you could share where we could buy such a gorgeous top like this one? I LOVE IT. your hair is so beatyful! i'm in love with it! ur look is great! love love the top and your hair!!! I love your dress! Definitely romantic! Love the dress and shoes! Very glam! wow ...I like your look, so glam! 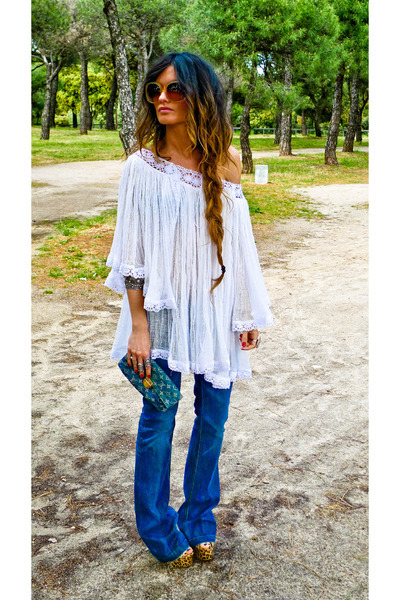 chic hippie! such a beautiful dress! love ths! Wow this is so chic!! wow! I love the boho look! Love your hair! Diosa! me encanta tu blusa! your hair is gorgeous & this outfit is very boho chic. love this! I love your outfit and I absolutely ADORE your hair! YOU LOOK AWESOME I WOULD WEAR ALL OF THIS, MY BDAY IS COMING UP HINT HINT AHAHHAHA JUST KIDDING, BUT YOU LOOK REALLY NICE , 2 THUMBS UP ! tienes un estilazo increible! me muero de la envidia (de la buena) cada vez que te veo...y que pelazo!! wapa! i love your hair and everything about this outfit! wow, beautiful!! your outfit is amazing!! love the top and ur hair is amazing!!! oh my gosh! i love your hair! GUAPISISISISISMA! Me encanta! Eres una reina bohemia! Me fascina como peinaste tu cabello con la trenza a un lado, me encanta como usaste el vestido como blusa y las gafas de sol son espectaculares! Eres un sol! Bellisima! Chic voted! I second the "stunning!" from Miss Ramona_C. I love everything, head to toe! fab outfit and I love the glasses!